The Garmin Approach S20 Watch is sleek, lightweight and versatile, with a new graphic interface providing golfers with comprehensive features such as AutoShot game tracking for more than 40,000 pre-loaded courses around the world, activity tracking and smart notifications and automatic golf course updates. The new AutoShot feature has been installed to record the location and distance of every shot automatically during the round while providing a useful game analysis after the round. The S20 is able to record helpful information such as yardages to the green, hazards and more. It is compatible with the new TruSwing golf club sensor to provide in-depth swing metrics. The Approach S20 has introduced brand new AutoShot feature which automatically records the distances of every shot to help golfers conveniently monitor their club hit distances without slowing their game. AutoShot round analyser automatically records the exact location of every shot during the game – then uploads it to the users’ Garmin Connect account. This helps golfers to better visualise and then relive every round they’ve just played thanks to the help of a vivid course view map. Golfers can gather vast amounts of data such as average distance for every club, longest driver per round and overall. The Approach S20 can be paired with the new Garmin TruSwing sensor – which provides players with in-depth swing metrics right from the wrist to improve their swing consistency and play. The CourseView auto updater on the Garmin Connect mobile app means players can receive updates to the courses they play most often. These updates are then sent to their watch automatically, thus making sure they always have the latest and greatest course data available at their fingertips. The S20 uses high-sensitivity GPS and comes pre-loaded with date for more than 40,000 international golf courses – with no additional fees or subscriptions to pay. The S20 provides precise distances to the front, back and middle of the green in large, bold, and easy to read numbers. It also shows the layout of the green and actual angle of attack on a clear, sunlight-readable display. As well as this, the Garmin Approach S20 measures distances to course targets like sand traps, water hazards and more, including doglegs and layups. Players can also use the Green View feature to manually position the pin to that days’ location in order to get the absolute best accuracy and measurements to the flagstick. 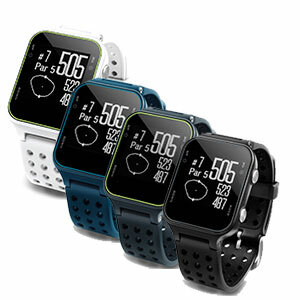 The Garmin Approach S20 Watch is exclusively at American Golf and available Week Commencing 8th February – so be sure to pre-order yours today! Leupold is a leading manufacturer of rangefinders, and now they have found a home at American Golf!